Crockpot BBQ Pork Sandwiches are a must make recipe for any busy family. 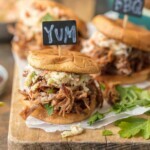 These SLOW COOKER BBQ PORK SANDWICHES are the ultimate fun finger food for any party! Use the meat for sliders, stuff them into quesadillas, or eat it over rice. The possibilities are endless! Spray inside of slow-cooker with non-stick cooking spray. Pour an inch of barbeque sauce into the bottom of the slow-cooker crock. Score the fat on top of the roast in a crisscross pattern, being sure to cut through the fat layer. Place the roast in the slow-cooker and pour 8 ounces of BBQ sauce over the roast. Place the onion wedges around the roast. Cover the slow-cooker with the lid. Set the temperature to HIGH and cook the roast (unopened) for 6 hours or until the meat can easily be pierced with a fork. Serve on buns and extra BBQ sauce or, if desired, place the pulled pork into a large bowl and mix it together with extra BBQ sauce to taste. Serve pulled pork with coleslaw on sandwich buns. Remove the core and outer layers from the cabbage. Cut the cabbage into pieces sized to fit into a food processor. Grate the cabbage in the food processor or with a grater. If no food processor is available, slice the cabbage very thin, and chop it until the pieces are very small. Grate the carrots the same size as the cabbage. Combine the grated cabbage and carrots and season with salt. Place the vegetables in a colander/strainer and set it over a large plate to drain for an hour. After an hour, squeeze the cabbage by twisting it in a clean dishtowel to remove as much moisture as possible. Combine the sugar and apple cider vinegar. Whisk together until sugar has dissolved. Add mayonnaise, celery seed, black pepper and chives. Whisk again, taste and adjust seasonings, if needed. *See note. Squeeze the cabbage again and add it to the dressing. Mix until well combined. Serve coleslaw with pulled pork on sandwich buns. *Note: Half the sauce will be used cooking the roast and the reserve used to mix with the shredded cooked pork or to serve alongside. *Note: If serving the coleslaw the next day, place the cabbage/carrot mixture, over a paper towel, in a lidded container. Place the mayonnaise mixture in a different lidded container, and refrigerate both overnight in the fridge. The next day, mix the pork and mayo mixture together before serving.